Posted by Tom Crimmins Realty, Ltd. on Friday, February 1st, 2019 at 12:08pm. THIS HOUSE FOR SALE CAN BE FOUND ON OUR WEBSITE TOMCRIMMINSREALTY.COM AS WELL AS NYC.FLEXMLS.COM (MULTIPLE LISTING SERVICE).JUST UNPACK!! 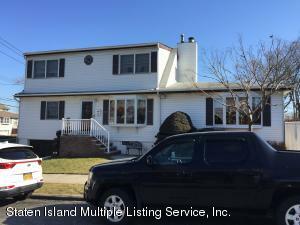 BEAUTIFUL 4 BEDROOMS CAPE IN WESTERLEIGH. ENTER INTO AN OPEN LAYOUT WITH A HUGE LIVING ROOM 2 BAY WINDOWS AND A GAS FIREPLACE, SLIDERS TO DECK. LARGE FORMAL DINING ROOM, LARGE EAT IN KITCHEN WITH STAINLESS STEEL APPLIANCES, CUSTOM KRAFTMAID CABINETS AND SILESTONE QUARTZ COUNTER TOPS WITH A PORCELAIN TILE FLOOR. ADDITIONAL DOOR LEADING TO DECK. 1ST FLOOR BOAST HARDWOOD FLOORS AND 2 ADDITIONAL BEDROOMS. 2ND FLOOR HOSTS AN ENLARGED MASTER BEDROOM W/WALK IN CLOSET AND ADDITIONAL EX-LARGE BEDROOM. FULL FINISHED BASEMENT WITH FAMILY ROOM FINISHES THIS HOMES LIVING SPACE. ADDITIONAL STORAGE IN ATTIC AND BASEMENT. BRING YOUR BUYER!! !IF YOU ARE LOOKING FOR MORE HOMES IN STATEN ISLAND PLEASE CLICK HERE TO BE DIRECTED TO OUR WEBSITE TO VIEW MORE OF OUR MLS LISTINGS AND/OR CONTACT US AT 718-370-3200 DURING OFFICE HOURS. WE OFFER A LARGE SELECTION OF CONDOS, TOWNHOMES, SINGLE FAMILY HOMES, 2 FAMILY HOMES, AND LUXURY HOMES. OUR TOP OF THE LINE REAL ESTATE AGENTS IN STATEN ISLAND'S BEST REAL ESTATE REALTY WOULD BE MORE THAN EAGER TO ASSIST YOU! WE CAN HELP YOU EVERY STEP OF THE WAY- FINDING AN AGENT, HOME SEARCHING, SELLING HOMES, STAGING A HOME, NEGOTIATION, HOME INSPECTION, MORTGAGE PROCESS, WALKTHROUGH, AND CLOSING. WE ARE PROUD TO SAY WE ARE THE BEST REALTOR IN STATEN ISLAND.